100-150g soft goat’s cheese (or as much or as little as you want, obviously) – I like the Abergavenny one from Sainsbury’s. 1 small bag of rocket. Salt, pepper, great quality olive oil and great quality balsamic vinegar or balsamic reduction. Are you ready for the “how to”? Drop everything else, because you’re going to have to really concentrate… Open bag of rocket and place in salad bowl. Dress the leaves with the olive oil, a nice peppery one, and a drizzle of balsamic. I usually toss it all about with my hands to get all of the leaves nicely coated and add a bit of salt and pepper as I go. (Not much, though, because the goat’s cheese and beetroot don’t really need a lot of salt and the rocket is already peppery.) 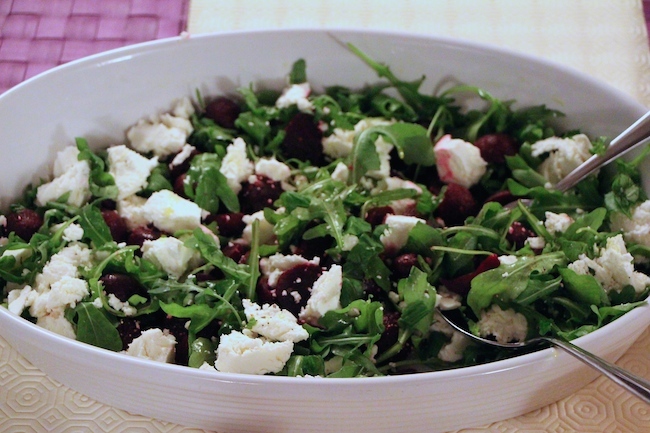 After this taxing bit of food prep, all that’s left to do is halve the already small beetroots and chuck them into the bowl and then add the goat’s cheese – I use two teaspoons to get little nuggets of cheese and slide them off into the salad. Don’t toss the salad about too much after this, otherwise the cheese gets all spread out and messy and the beetroot makes everything pink! That’s why I dress the leaves first.